Organizations will have to mind their step as new regulations will reshape the practice of healthcare in myriad ways, but none as much as its effects on coding. After years of discussion and debate, the much-anticipated move toward a new coding system has finally arrived. In August, Health and Human Services (HHS) announced a proposed regulation that will replace the ICD-9-CM code sets now used to report healthcare diagnoses and inpatient procedures. A proposal is currently on the table to adopt and implement the new, more advanced system, ICD-10, by October 1, 2011. And from all accounts, the powers that be plan to stick to that date despite heavy resistance from many lobbyists. According to Sue Bowman, RHIA, CCS, director of coding policy and compliance with the AHIMA, ICD-10 reflects the need to accommodate a much more complex scheme of classifying diseases in light of recent advances in disease detection and treatment through innovations such as biomedical informatics, genetic research, and international data sharing. With ICD-10 already adopted by countries such as Canada, the United Kingdom, Germany, France, Russia, Brazil, South Africa, China, and Australia, many industry experts believe that the United States is in a position of playing catch-up with the collaboration. Most healthcare experts agree that the move toward the new system will enhance healthcare delivery, but the implementation process does not come without its concerns. With increasing pressures on healthcare organizations to make substantial investments in IT infrastructure, some believe the time frame for implementation is unrealistic. As the most widely used diagnostic taxonomy in healthcare, the World Health Organization’s International Statistical Classification of Diseases and Related Health Problems has long provided the United States a system for coding that is used internationally to classify morbidity and mortality data for vital health statistics tracking and health insurance claim reimbursement. The 10th edition—ICD-10—was introduced in 1992 to address advances in medical knowledge and issues associated with morbidity and mortality reporting. Currently, the United States is the only country in the industrialized world that has not adopted the system. A recent ICD-10 white paper published by the Deloitte Center points to a number of key benefits that healthcare institutions will achieve by the new system’s ability to “access more granular data.” Some tangible examples include improved claims adjudication and reimbursement rates due to more accurate payments for new procedures and fewer miscoded claims; improved patient safety and care via the sharing of more specific data on drug side effects and usage among key players; and improved utilization management through the efficient use of codes by payers along with the exchange of patient information across the care continuum. Perhaps the biggest controversy surrounding the move to ICD-10 rests in whether the government is allowing enough time for the healthcare industry to get on board. While history may offer some insight into how quickly the industry may respond, Bernard says the greatest barrier to the timeline is the costs associated with systems changes, training, and productivity. The Deloitte white paper suggests that the massive overhaul of the nation’s medical coding system under ICD-10 has the potential to overtake Y2K in terms of impact and cost. Keckley believes it will require a massive wave of system reviews, new medical coding or extensive updates to existing software, and changes to many system interfaces. Because of the complex structure associated with ICD-10 codes, implementing and testing the changes in such areas as electronic medical records, billing systems, reporting packages, and analytical systems is expected to require more effort than simply testing data fields. Ultimately, it will involve a system overhaul and extensive training for all constituents who access diagnosis codes, touching all payer administration and revenue cycle operational systems. Alongside all the benefits that have been proposed as the outcome of ICD-10 implementation, Bernard suggests there will be significant negative impacts if it takes place as proposed. She cites claims delays, adverse effects on physician productivity, extended revenue cycles leading to increased medical bankruptcies, and more errors in claims requests. Another issue that poses a roadblock centers around chart mapping. Bowman notes that HHS will not likely require discharges and charges prior to the start date for ICD-10 to be converted from ICD-9, but the larger issue, according to Bernard, is that payers will need to update all mapping of ICD-9 to ICD-10. Keckley says U.S. healthcare organizations have a lot to consider before deciding how to address ICD-10 compliance, adding that payers and providers wanting to remain viable should consider ICD-10’s impact to their overall strategic plan before choosing an adoption strategy. The Deloitte white paper notes that only those entities that seek to exceed “basic compliance” through the implementation will reap the potential of the expected benefits of ICD-10, which means driving the system into all core administrative and clinical functions. The study anticipates that only 20% to 25% of healthcare organizations will approach implementation this way, and those entities that choose the bare minimum required by law will reap a negative return on investment in the process. Bowman suggests beginning the strategic process early, emphasizing that the rule advocates getting started immediately. To that effect, Bowman has developed an AHIMA white paper that breaks the implementation into four phases and provides a comprehensive checklist. Bowman terms the first phase of the process as impact assessment, pointing to the need for organizations to measure the effects of the new coding systems and to identify key tasks and objectives. Major projects will entail the creation of an implementation planning team, budgeting for required information system changes, and the assessment, budgeting, and implementation of education initiatives. Phase 2 of the process—the overall implementation phase—involves getting the required information system changes up and running, a follow-up assessment of documentation practices, and an increased emphasis on making sure the organization’s coding professionals are properly educated. Go live encompasses the third phase and involves key tasks such as the finalization of systems changes, testing of claims transactions with payers, more intensive coder training, and monitoring of coding accuracy and the results of reimbursement with prospective payment systems. The postimplementation process (phase 4) consists of monitoring coding accuracy for reimbursement, identifying other data management impact, reviewing coding productivity, and continuing with appropriate coder training. More detailed information on each of these phases can be found at www.ahima.org/icd10/ICD-10PreparationChecklist.mht. In a recent ICD-10 white paper, the Deloitte Center for Health Solutions points to the potential that the new coding system could bring to the healthcare industry. Experts predict that the vast majority of healthcare organizations will do only the bare minimum to comply or moderately exceed the mandates and that a small percentage—less than 15%—will use ICD-10 to further their overall agenda. • Merger and acquisition opportunities that are an outgrowth of some organizations opting out of ICD-10 remediation due to the investment required. • Shared service opportunities with entities looking for outsourced solutions for ICD-10 remediation. • Information and data opportunities for healthcare entities that are early adopters of ICD-10. These groups will be in a position to partner with their peers and constituents to improve data capture and analytics. 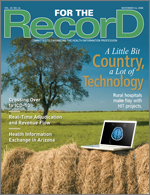 • Personal health record opportunities for entities willing to leverage the detailed informational structure of ICD-10, making them, as well as regional health records, more achievable. • Opportunities to develop a clinical documentation excellence program. • Opportunities to leverage nontraditional staffing models to better position an entity against coding shortages.